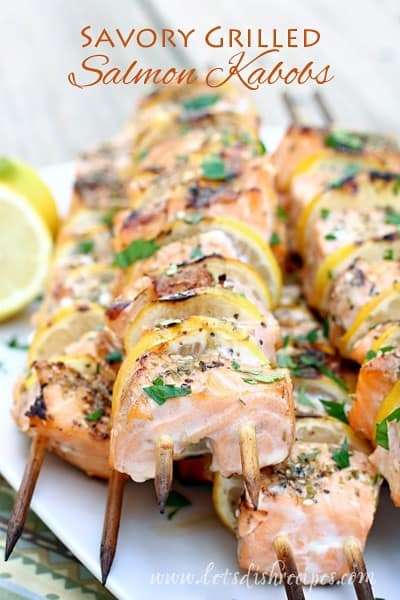 BROWN SUGAR LEMON GARLIC BUTTER SALMON — This sweet and spicy salmon is coated in a buttery lemon, garlic and brown sugar glaze, with a hint of cayenne for added kick. My boys are all huge salmon fans, so I always pick some up when I go to Costco. 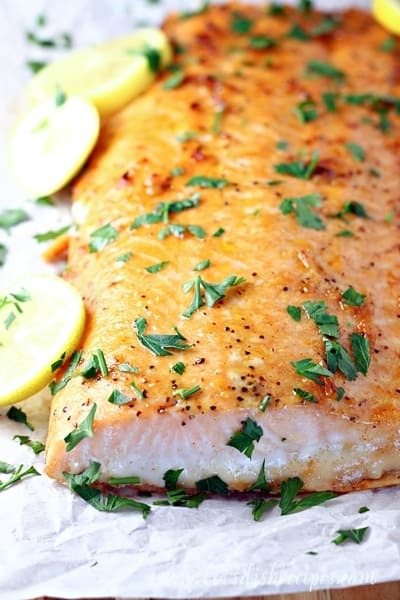 And this Brown Sugar Lemon Garlic Butter Salmon is our new favorite way to prepare it. Garlic, butter, lemon, herbs and spices–pretty much all the flavors I love to pair with fish are include in this recipe. The salmon is brushed with the sauce and cooked, then basted with additional sauce and broiled for a beautifully glazed finished dish. Topped with some fresh parsley and lemon slices, it’s a perfect light meal any day of the week. And the whole thing only takes about 20 minutes to make from start to finish. Which makes it an easy but elegant meal for a busy weeknight. This recipe also works well with Tilapia or other varieties of white fish. We like to serve this with our favorite kale salad and a side of rice or a baked potato. It’s the kind of meal that almost makes us feel like we’re eating in a fancy restaurant. Only it’s a lot less expensive! This recipe will also work with frozen, thawed salmon fillets if that’s what you have available. Oh, and you definitely don’t want to skip the step of lining your pan with foil or parchment paper. The glaze can get pretty sticky! 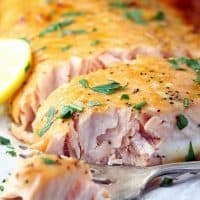 I hope you enjoy all the delicious flavors of this quick and easy salmon dish as much as my family does! 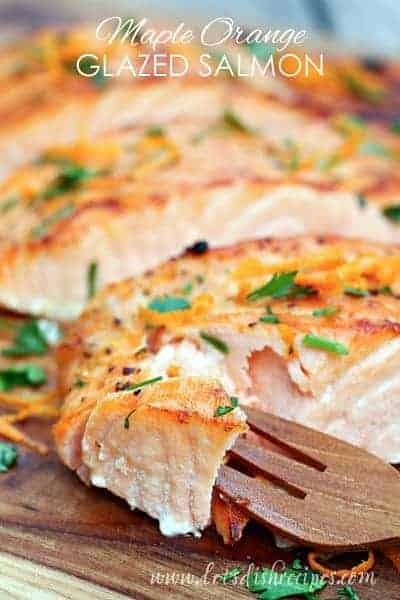 Be sure to save this Brown Sugar Lemon Garlic Butter Salmon recipe to your favorite Pinterest board for later. 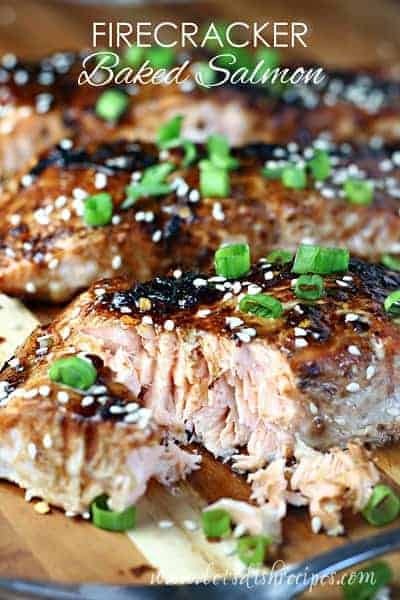 This sweet and spicy salmon is coated in a buttery lemon, garlic and brown sugar glaze, with a hint of cayenne for added kick. Preheat oven to 400 degrees. 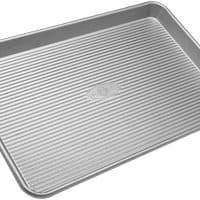 Line a large baking sheet with foil or parchment paper. 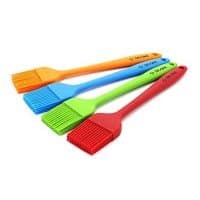 Spray with non-stick cooking spray. Season salmon with salt and pepper and arrange on prepared baking sheet. 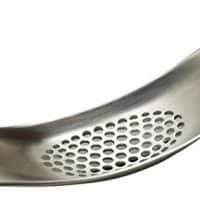 Combine butter, sugar, lemon juice, garlic and spices in a medium saucepan. 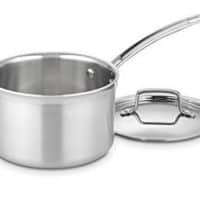 Bring to a boil over medium-high heat and boil for 2-3 minutes, or until slightly thickened. Brush salmon with half of sauce. Bake for 10-15 minutes, or until fish flakes easily with a fork. While salmon cooks, continue to simmer remaining sauce. Remove salmon from oven and turn on broiler. Brush salmon with remaining sauce and place under the broiler until slightly caramelized, about 3-5 minutes. Garnish with fresh parsley and lemon slices, if desired.